The small Montegabbione town, which is usually omitted from the most obvious tourist itineraries, is a simple village which owns its identity, as do the small towns of the surrounding area, to the Medieval Period. It is situated at the highest altitude when compared to the other villages, showing, with good probabability, that the founding of Montegabbione was a calculated thought in response to the need of a sighting post along the boundary between Orvieto and Città della Pieve. 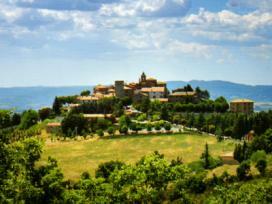 Furthermore, its position allowed to control the road leading from Città della Pieve toward Todi.